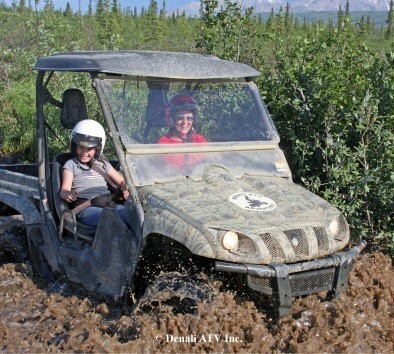 Get out and ride in the Alaskan Boreal Forest! Traveling at speeds up to 40 mph, maneuver through the taiga to picturesque panoramas of the Alaska Range. Observe glacial moraines and historic archeological dig sites while navigating tree rutted trails, mountain-fed creek beds, and boggy tundra. Spend more time riding on the trail than any off-road adventure tour and learn about the impact of Chris McCandless’s fateful journey made infamous by the book and the movie, “Into the Wild.” Stops are made for photography, wildlife sightings, and for a complimentary snack and drink. Tackle the terrain and share the thrill in a two passenger Yamaha side-by-side ATV. Trails are challenging for all experience levels. Maximum weight is 450 lbs. Minimum age to drive is 16 years. A waiver must be signed. Bring your driver’s license. Ride will be bumpy. Pregnant women or guests with back or neck problems are not allowed to participate. All riding gear is provided, including rain gear (weather dependent). Car seats and booster seats are available upon request.